Nearbuy is a local based deals & coupon website script which is very simple and highly effective and has a high potential that involves the collective buying of deals. It serves major international markets that offer one coupon per day in each market. It comes from the famous and amazing Groupon, it offers the users for a single fantastic deal and it is suitable for any kind of business and a variety of cities. It has categories and sub-categories of the products; we can view the merchant’s lists and member’s lists. This Nearbuy clone script allows vendors to discover, buy and save these local merchants. Through this nearbuy clone, users can get most exclusive coupons with great discounts and save money. You can also get amazing and exciting cash back offers on every purchase! VoucheCodes PHP Software is based on the business abstract and an ideology that our script supports all the categories of products which you want to purchase. This script is also applicable for those who wish to do local business, national business and multi-national businesses. Daily deal software furnishes all the details about the merchants and the users and it comprises of two types of logins, merchant login and the user login. Admin panel has features like website settings; which are general site settings, payments, website page editing, template manager, email settings etc., you can manage the full website like admin accounts, deals, orders, coupons, partners, categories etc., it is possible for the vendors to know the statistic details about deals, members, orders and subscribers. You can pick up the best offers by filtering the results by categories, location and then easily sort them by place, distance and popularity. It is possible to shortlist the deals, coupons and offers what do you like and share short listing details with friends. It has active recent upcoming deals, so you can refer suitable and perfect deals for your requirement. This nearbuy is an online marketplace platform, it allows vendors to connect with local merchants and engage with others across many cities, choose from a wide range of offers & deals, find merchants around you, and have a hassle-free buying experience. 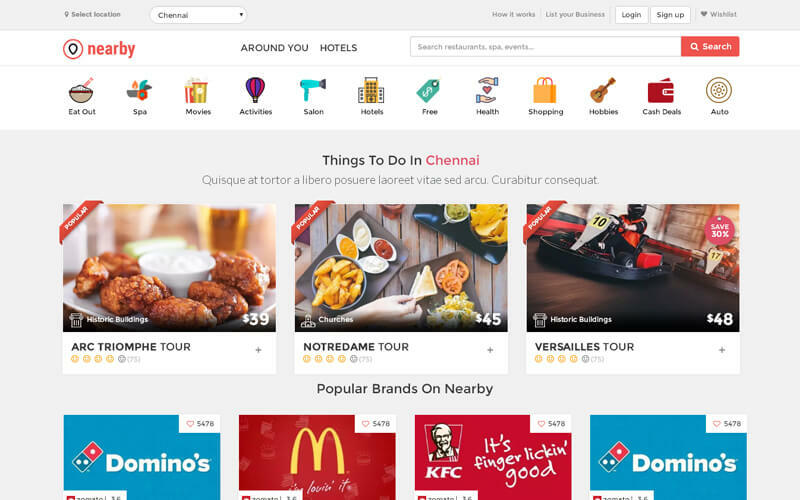 Nearbuy, will find out the complete listing of the deals which are available at your city. Nearbuy script has nearly 80 eye-catching features, unlimited categories and sub-categories and has different cities listings. This platform consists of a daily deal website activated with eye-catching features like e-commerce, different payments options like PayPal payment gateways, various search options, Google map, WIRE transfer, multi-currency support, discount hold, you can download the voucher for reference, newsletter, etc., that makes the visitors of the website awestruck. Nearbuy clone script has a high security login system, so you can access this script freely. It is very easy to establish with full support and free installation as per your requirements. Through admin panel you can manage and handle this site with ease and is highly user-friendly, our nearbuy has high features like being mobile-friendly, has SEO-friendly URLs, social sharing login, social media integration, , full source code, etc., and has new features like bonus and side deal, etc. Great script to search the nearbuy sellers and merchants.. I really like Vouchecodes script where I can get more categories of products. I can easily track products and its mobile friendly.